This exciting magazine showcases the discoveries, inventions and excellence of UD's faculty, staff and students. 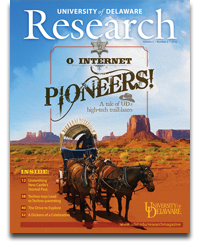 Our latest issue spans UD's pioneering contributions to the Internet, to parenting techniques for internationally adopted and foster children. 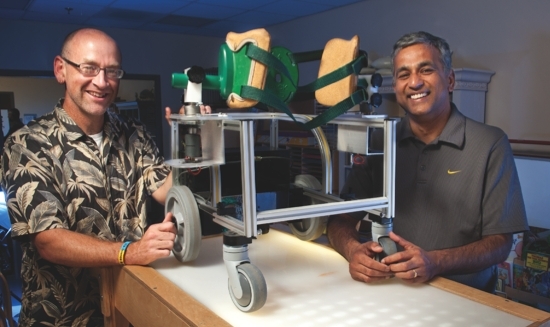 A shining tribute to the "Sun Queen"
Cole Galloway, associate professor of physical therapy (left) and Sunil Agrawal, professor of mechanical engineering, have outfitted kid-sized robots to provide mobility to children who are unable to explore the world on their own. hen Cole Galloway takes his research show on the road, one of his favorite things to share with his audience is a video of a newly mobile baby wreaking havoc in a living room filled with toys. Galloway heightens the effect by showing the movie at triple speed so that the audience quickly becomes as exhausted as both the baby and her parents are at the end of the day. As a physical therapist and developmental scientist, Galloway knows that the basic movement behaviors of kids between the ages of one and three — the so-called toddler years — are more than just movements. The continuous stream of activity is a complex “exploratory engine” that children use to build bigger, better bodies, construct more complex brains, form their first friendships and lay the foundation for school readiness. “Adults have long recognized that children’s brains and behavior expand during the early years,” Galloway says. “More recent is the recognition that their mental, social and emotional development is intimately linked to their physical and social exploration of the world. For adults trying to keep up with a toddler, exploration can be simultaneously frustrating, exhausting and exhilarating. To Galloway, the exploration gap between typically developing children and children with mobility issues is simply unacceptable, and he has devoted much of his career to doing something about it. Several years ago, he began working with mechanical engineering professor Sunil Agrawal to develop robot-enhanced devices that provide mobility to children as young as six months. From 6 months to 3 years of age,healthy children have the ability to move toward items that capture their interest. this allows more opportunitites to learn from their environment and form important neurological connections for brain and behavioral development. The majority of brain synapses or connections form by age 3, and 85% of a child’s brain develop- ment is completed by age 5. More than a half-million children suffer from mobility issues from birth on. Number of pediatric power wheelchairs currently available for children under 2. UD was the ideal place to launch their collaboration. Agrawal’s Mechanical Systems Laboratory provided the “manufacturing plant” for the vehicles, while the University’s Early Learning Center (ELC) provided the young drivers, indoor and outdoor “test tracks,” and expert early educators and pediatric therapists such as Tracy Stoner and Terri Peffley. The data collected using robots developed in the first phases of the project convinced Galloway and Agrawal that they were on the right track. As Galloway and his team discovered when they placed a mobility robot in an ELC preschool class, children who have experienced several years of immobility may learn to drive without understanding how to use their newfound mobility to play with friends or with teachers. By 2010, the science and technology in the project were emerging, but the pace was a challenge for Galloway. With no new commercial devices on the market to provide early power mobility, he became increasingly frustrated at his inability to help parents, clinicians and educators who were excited about the work but wanted help for their children now. Galloway is a bit of a toddler himself. Like a child in the throes of the “terrible twos,” he doesn’t like the word “no.” So he adopted another behavior common to devious youngsters — if dad says no, ask mom … or better yet, climb up and get it yourself. One day about a year ago, he found himself at Toys“R”Us admiring a colorful array of plastic ride-on cars and trucks. After purchasing an assortment of the inexpensive vehicles, he went to Jo-Ann Fabric & Crafts and Home Depot, where he bought fabric, foam, straps, fasteners and PVC pipe. 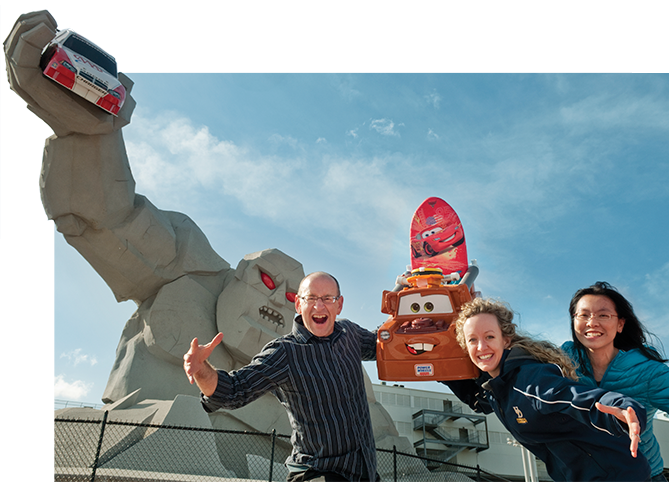 Back on campus, Galloway and his students began using the materials to customize the cars for use by individual kids. 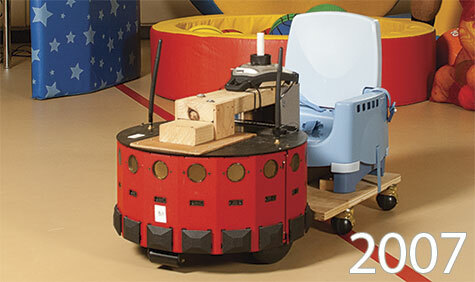 Babies Driving Robots had spun off a new project: Babies Driving Racecars. Galloway says the low-tech is not replacing the high-tech but complementing it. Galloway’s inner toddler was becoming a bit calmer. “Marrying the high-tech to the low-tech is leading us to new ‘Go-Tech’ possibilities in which scientific rigor is strapped to a racecar,” he says. Sara Huang encourages Brenden to use a shape-sorting toy. The project is also providing a rich learning environment for graduate student Christina Ragonesi and postdoctoral researcher Hsiang-han (Sara) Huang. Ragonesi is working simultaneously on a doctorate of physical therapy degree in UD’s nationally ranked physical therapy program and a Ph.D. in the Biomechanics and Movement Science Program. When Galloway challenged her and Huang to design a car that works a child’s leg strength and standing balance, she instrumented the seat of a toy car so that the car goes forward only if the child stands and instantly stops if he sits back down. “Kids will work hard to stand and keep standing if it means they can get the car to move,” she says. Huang joined Galloway’s group in August 2011 after earning her research doctorate at Boston University. Since arriving at UD in 2000, Gallo-way has also involved hundreds of undergraduates and high school students in various projects. Last summer, for example, 16-year-old David Glanzman engineered some electrical and mechanical modifications by adapting a “Mater” truck so that it would meet the needs of then-19-month-old Brenden, who has cerebral palsy (see p. 43). With plans to pursue a career in electrical engineering, Glanzman gained valuable insight into what happens when engineering meets kids. “In electrical engineering, you have problems with defined solutions,” he says. “It’s different with pediatrics. Kids are dynamic, and they change over time — you have to be creative to adapt to that.” Glanzman is set to return this summer to continue his work. One of Galloway’s current goals for the racecar project is to take what he and his team are learning and create a toolkit for families, medical and educational professionals, and researchers who want to adapt the cars for kids with special needs. He emphasizes the importance of doing this right. The next step is to determine how many of the high-tech advances that have been incorporated into the robotic devices developed in Agrawal’s lab can be added back to the low-tech platform. Potential add-ons include force and motion sensors, GPS and other performance-tracking capabilities such as onboard microcomputers and web cameras. This will allow laboratory-grade data gathered from living rooms, playgrounds and backyards around the world to be sent back to the UD lab. Several years ago, Galloway and Agrawal envisioned programming a device to take a child to the edge of a group, to just wander or to follow a specific child or an instrumented toy such as a ball. “This capability would enable us to place the child in the flow of the social scene and see what happens,” Galloway says. “Sunil and Xi Chen, his graduate student, are conducting this project on socially mobile robotics right now at the ELC with our mobile robot.” If this is successful, Gallo-way plans to implement the same concept with racecars for children who have social impairments such as autism. Right now, his overriding goal is to get the technology into every possible environment where kids are — from homes and playgrounds to preschools and even long-term care facilities for medically fragile children. Galloway emphasizes that in both the low- and high-tech realms of his research, the use of mobility devices never replaces efforts to develop a child’s own ability to walk and run. Galloway never stops looking for creative ways to help individual children while also seeking avenues to spread the message and the technology to parents and clinicians. One idea he is currently exploring is to pilot racecar camps. The research team would outfit the campers with cars, spend a week teaching them to drive, and then send the kids and cars home. The children’s progress would be monitored for the next six to nine months. The Baby Mobility Lab houses an entire fleet of customized vehicles for kids with motor and developmental delays. 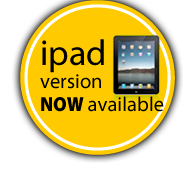 UD is the ideal place to put this cool technology in action. the Mechanical systems Laboratory provides the “manufacturing plant” for the vehicles, while the early Learning center provides the young drivers, indoor and outdoor “test tracks” and expert early educators and pediatric therapists. Biodriven mobility unit supports driving and walking. 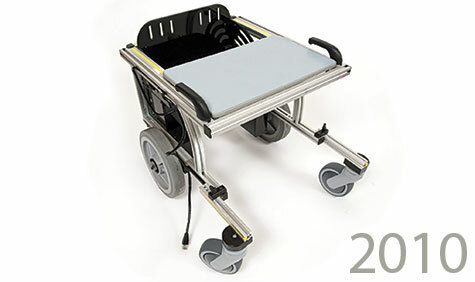 Driving Module (shown) converts to Power walker to provide maximum mobility. 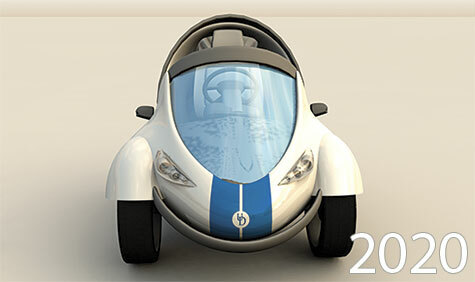 Steering, seating and acceleration, options enable modifications to fit any child's abilities. Device is small, light and rugged for indoor/outdoor all-weather use. Unit relays child's daily mobility and socialization performance to UD HQ. 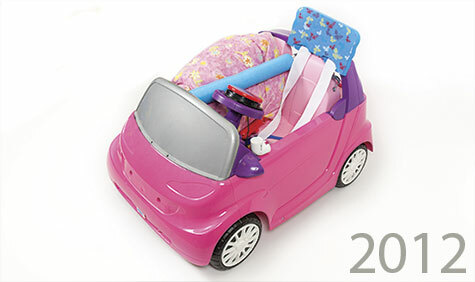 The vehicles in the baby mobility project have evolved over the years from a custom robotic device (2007) to a lightweight, convertible power chair/walker (2010) to modified toy cars (2012) to the DARE prototype (~ 2020). Brenden Bolen’s Mater truck wasn’t a birthday present, but the plastic ride-on vehicle was a gift of another sort – it enabled the two-year-old to be in the middle of the fun with the guests at his party. For Brenden, who has cerebral palsy, Mater is more than a toy. It’s an avenue to the socialization and exploration he would otherwise miss out on. It’s an entrée into the world of kids. It’s the first step toward turning him into a knucklehead. And when you’re two years old, you’re supposed to be a wonderful knucklehead. His customized car has opened the door for Brenden to interact with other toddlers at UD’s Early Learning Center. At home, it’s enabled him to play ball with his dad and pet a therapy dog from Paws for People. Prof. cole Galloway sees family involvement as a critical element in driving success. Kimmy Burge and Brenden catch a moment together. Mater is part of research that tracks Brenden’s progress quantitatively, and his mother already has anecdotal evidence that the car is driving Brenden’s development. One community sector that cole Galloway recently connected with is the world of auto racing. with Dover international speedway less than 50 miles from the UD campus, he saw potential for a collaboration with Dover Motorsports inc. The organization has strong ties to Autism Speaks, which could provide the perfect window for the racecar project. “Racecars may offer children with autism a mode of play with the physical space that they need to be emotionally comfortable while enabling them to engage in a fun activity typical of their peers,” Galloway says.